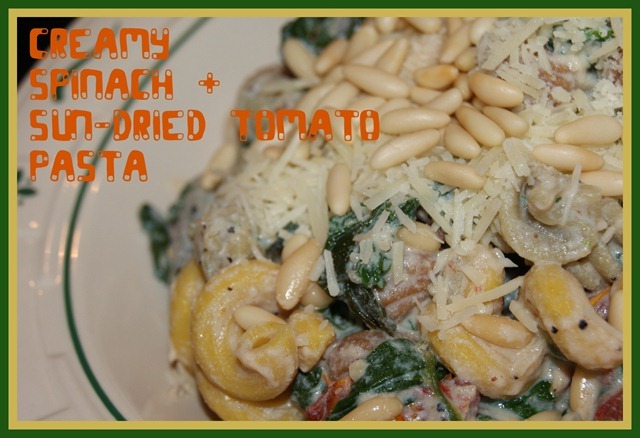 This meal will keep you eating your veggies (spinach and tomatoes) but has a tiny bit of creamy indulgence built in too. 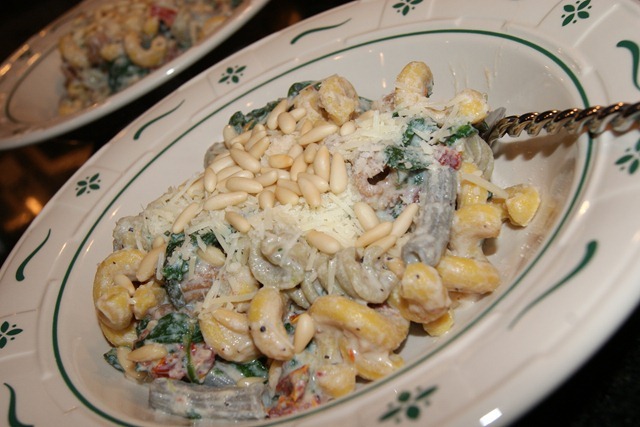 An amazingly refreshing pasta made with spinach & sun-dried tomatoes, topped with pine nuts and shredded parmesan cheese. This dish may look like it takes forever to make, but I guarantee you it comes together quickly. Hands down, a wonderful, uncomplicated dinner. 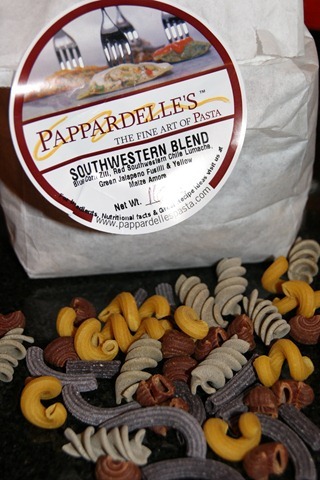 Pappardelle’s Southwestern Blend with blue corn, red southwestern chile, green jalapeno and yellow maize flavored pasta. You can get the many flavors of Pappardelle’s Pasta here. 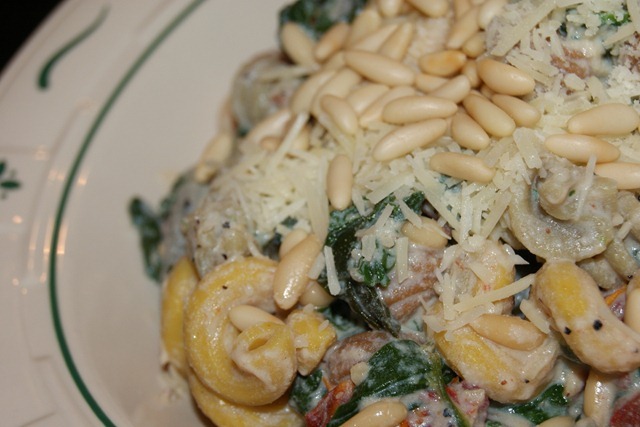 Fresh spinach, sun-dried tomatoes, pine nuts and ricotta cheese make up the sauce. Fresh spinach cooked stovetop without any oil. Add in fresh pepper, minced garlic and garlic salt. 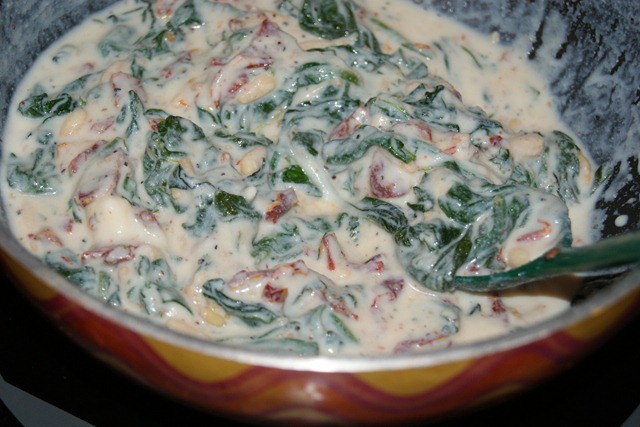 To the spinach & tomatoes, you add in ricotta and milk to make it creamy. 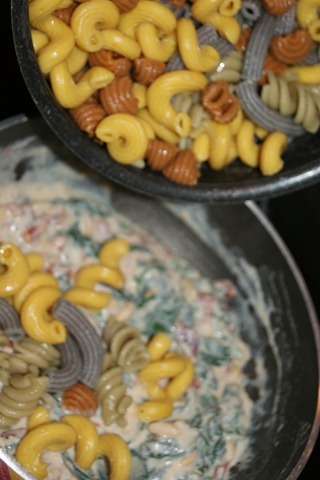 Pour in the cooked and drained pasta to the creamy sauce. And VOILA~You got a tasty pasta dish with a wonderful sauce. 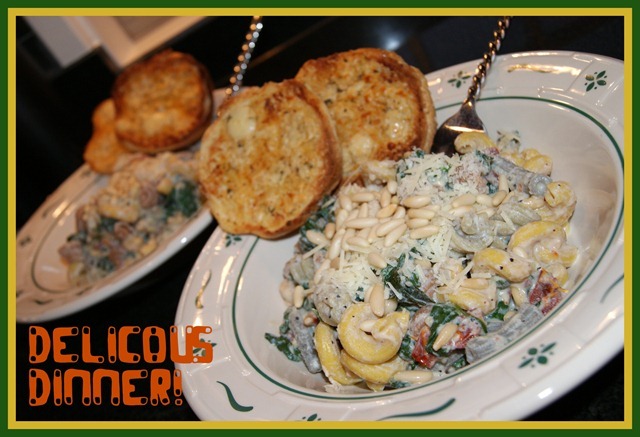 The creaminess of the ricotta cheese sauce, added to the flavored pasta makes this a WIN, WIN DINNER! Cook pasta according to pasta directions. Drain. 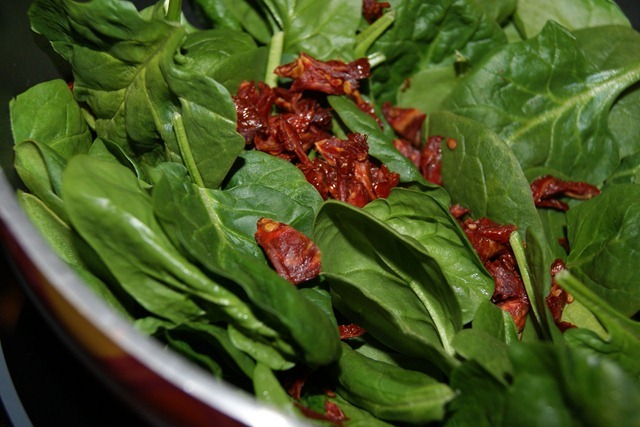 In medium skillet, cook spinach over medium heat until wilted, adding in the sun-dried tomatoes. Then add in black pepper, garlic salt, ricotta cheese and milk to make a creamy sauce. 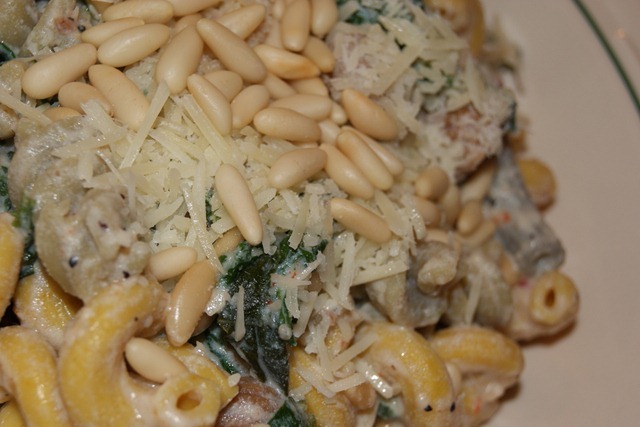 I also added in half of the pine nuts to the sauce. Continue to stir over medium heat until heated through. 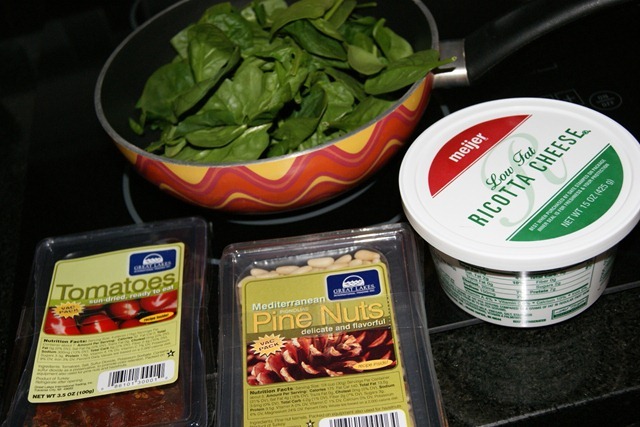 Add pasta in to creamy spinach sauce and stir to mix. 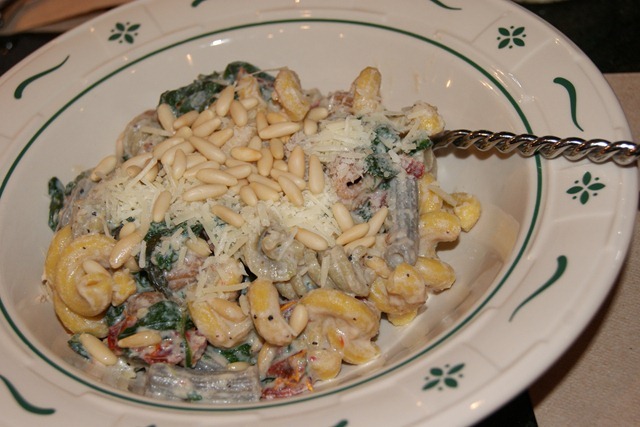 Transfer to serving bowls and top with the rest of the pine nuts and add parmesan cheese to the top. Also good with garlic bread on the side! 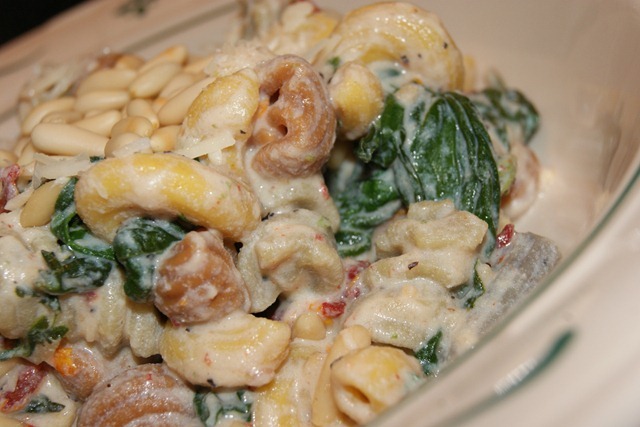 Fresh spinach, sun-dried tomatoes and ricotta make up this delectable pasta sauce. Pine nuts were a new purchase for me, something I hadn’t ventured to buy before. 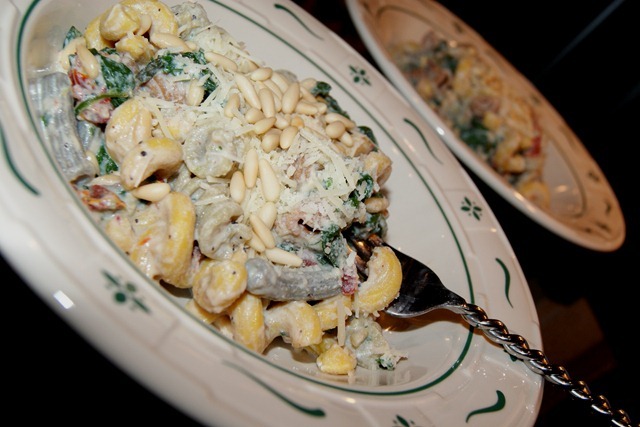 They are very soft nuts and a great addition to this pasta dish. Yes, I am raving about this dinner. It was THAT good! Cugino’s makes the best cheesy garlic bread spread ever. Check it out here. This pasta dish will keep your friends and family happy, satisfied and wanting more. Very creamy and delicious! Makes you want to have seconds, for sure! I made something similar to this a week ago and called it P&S, I Love You. To see that post click here. 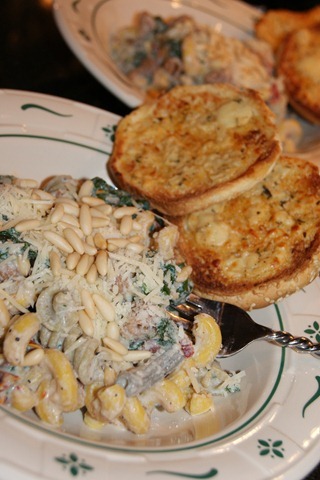 This entry was posted in Deliciousness and tagged dinner, Pasta, spinach. Bookmark the permalink. This looks absolutely fantastic! 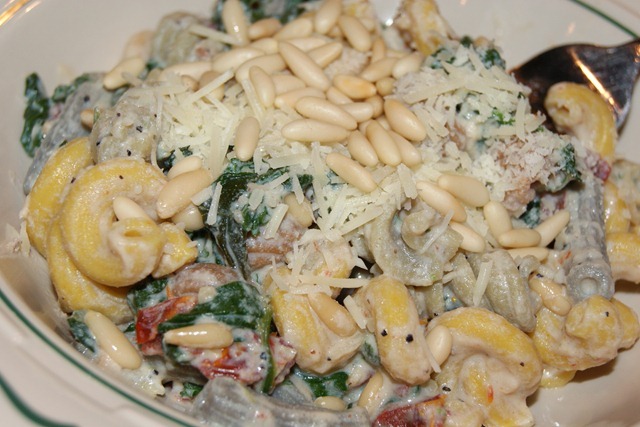 I have made pasta with spinach and sundried tomatoes but adding the ricotta and pine nuts is inspired. I’m definitely making this. Yum! I love the creamy dressing. I’ve only used ricotta in lasagna and the consistency of it skeeves me out but I could definitely be on board with ricotta in sauce form like this. 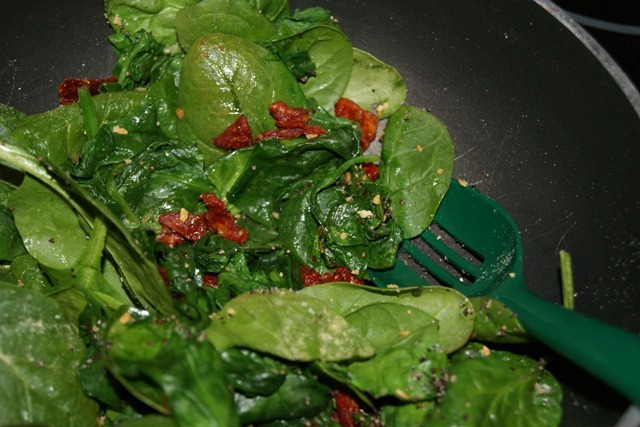 Thanks for posting–anything with cheese, sun dried tomatoes and spinach has my heart! 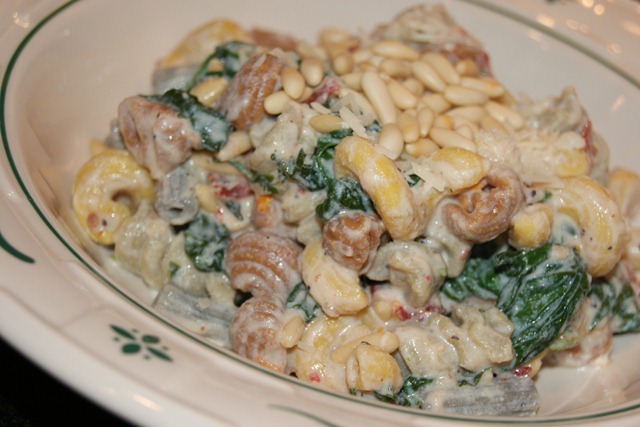 Pinenuts and pasta are such a good combo.